Buddy Products' Data Racks keep important papers and files at your fingertips without taking up floor space. This durable steel rack features seven pockets, each with a convenient cutout for easy access. The oversized pockets are designed for file folders, data reports and more. Comes with an attractive baked enamel finish on the textured steel. Buddy Products' Seven-Pocket Data Rack is made in the USA and comes backed by a limited two-year warranty. 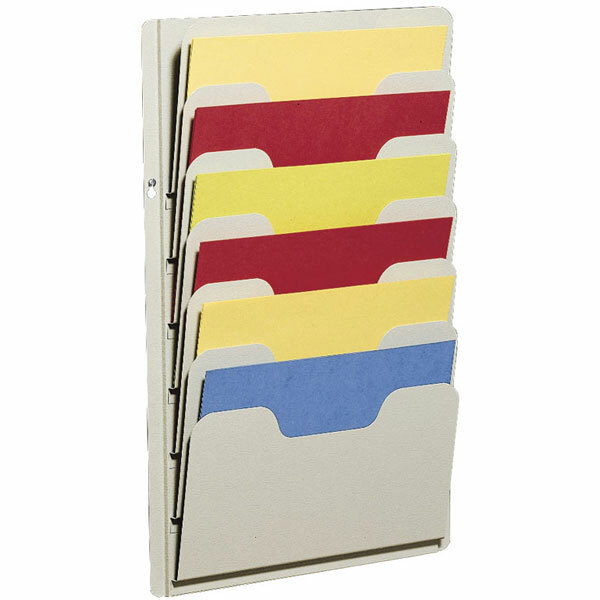 Pocket Dimensions: 12 5/8" x 3/4" x 6 3/4"
Buddy Products' Data Racks keep important papers and files at your fingertips without taking up floor space. This durable steel rack features nine pockets, each with a convenient cutout for easy access. The oversized pockets are designed for file folders, data reports and more. Comes with an attractive baked enamel finish on the textured steel. Buddy Products' Nine-Pocket Data Rack is made in the USA and comes backed by a limited two-year warranty. Looking for a way to store files and data in your crowded office? Sandusky Buddy's Data Racks keep important papers and files at your fingertips without taking up floor space. This durable steel rack features your choice of seven or nine pockets, each with a convenient cutout for easy access. The oversized pockets are designed for file folders, data reports and more. Comes with an attractive baked enamel finish on the textured steel. Sandusky Buddy's Data Rack is made in the USA and comes backed by a limited two-year warranty. Call us at (877) 839-3330 and our friendly customer service team will be happy to assist you a quote or order.